Historic Old Sturbridge Village, several fine inns, shopping, antiques, Russian icons, and beautiful countryside are among the attractions at the junction of I-90 (Mass Pike) and I-84. Sturbridge, Massachusetts is a pretty, historic town in the beautiful hills of east-central Massachusetts right where the Massachusetts Turnpike (I-90) intersects with I-84, a major route to Hartford CT and New York City (map). It's a convenient place to stop for a meal, a night's rest, and some sightseeing. Highlight of a Sturbridge visit is Old Sturbridge Village, a "living museum" of New England history and culture, with period buildings, traditional activities and crafts, and costumed re-enactors who take their work of historical recreation seriously. Being near the junction of two major highways, Sturbridge also has numerous hotels, restaurants and other travel services. 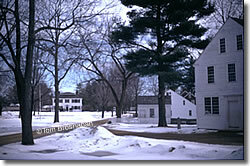 Winter scene at Old Sturbridge Village.